For the past week, the global numerical prediction models, including the GFS and ECMWF, have hinted at the potential of a negatively tilted trough digging into the Southeast. They have consistently indicated a strong area of low pressure across the Arklatex propagating off to the northeast into Missouri and Kentucky. Ahead of the low, an enormous amount of moisture is being pulled into the Gulf Coast and across Alabama and Georgia. Sunday’s system poses several threats for the Gulf Coast region, including flooding due to heavy rains, damaging wind gusts, and isolated tornadoes. This system will provide a one-two punch for North and Central Georgia Sunday. Round one will occur in the morning hours with heavy rain. 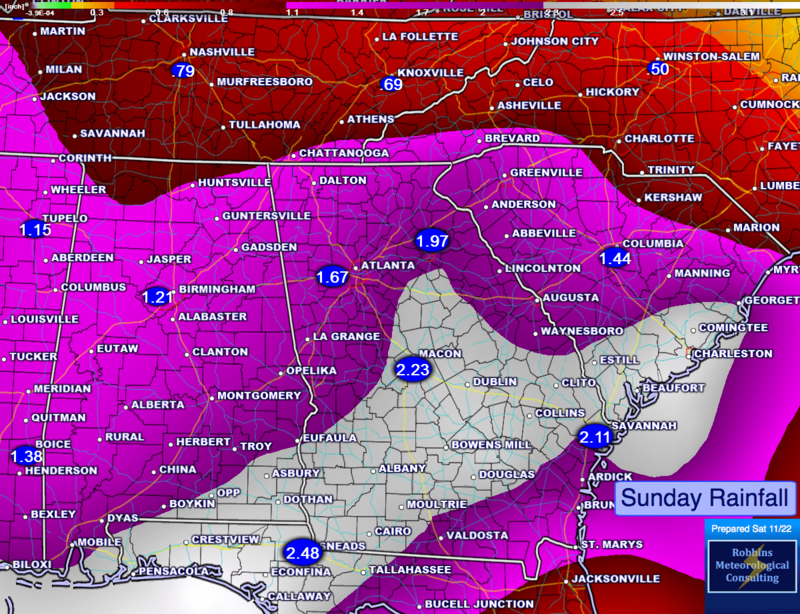 We could easily see amounts of 1-2 inches in northern Georgia, with 2-3 inches across Central Georgia. Round two should develop during the afternoon as a line of storms form and moves to the east. Round two, if it can develop, would have the best potential to create a few strong to severe storms, especially across South/Central Georgia. The severe threat looks extremely small across northern Georgia (i.e., Atlanta northward) where heavy rain is our primary concern. However, I cannot rule out gusty winds in a few stronger storms along I-20. What will happen across North Georgia versus Central and South Georgia? 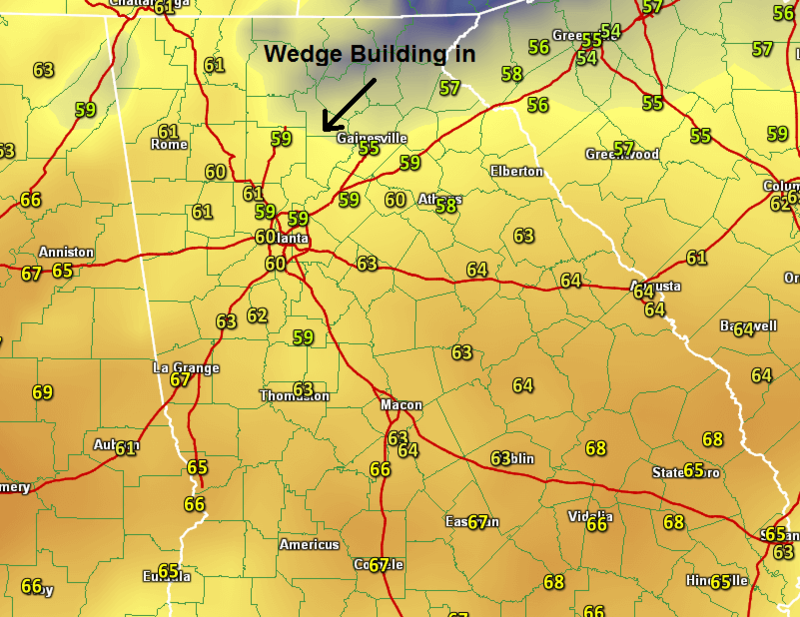 As always, it all depends on the wedge, also known as cold air damming. The main two ingredients we need for severe weather are wind shear and instability. In this current setup, we have plenty of shear, but finding instability is going to be the challenge, particularly areas from Atlanta northward where the wedge tends to linger. High pressure off the Virginia coast today is reinforcing a dry, cool air mass across North Carolina, South Carolina, and North/Central Georgia. An easterly wind at the surface will keep these areas stable and dry. We call these easterly, low level winds the “wedge,” or cold air damming. Meanwhile, moisture from the Gulf of Mexico will continue to develop and surge to the north late this evening into the overnight hours of Sunday morning. The rain that pushes to the north into Florida and South Georgia is associated with a warm front. Along the front, there will be relatively high helicity (vertical spin in the atmosphere) and decent directional wind shear. However, instability is lacking, especially across Central and North Georgia. While severe weather appears highly unlikely, it is really hard to completely rule out isolated damaging wind gusts or a spin up tornado. With that said, the small threat for damaging wind gusts and a spin up tornado will occur primarily along the Gulf Coast and into South/Central Alabama and Georgia. Sometimes interactions of the wedge and the warm front can create isolated tornadoes. The second wave will move in later in the day on Sunday. By that time, the warm front will likely have boosted the dew points into the 60s across South and Central Georgia with the atmosphere destabilizing. Convective Available Potential Energy (CAPE), which measures instability, should increase into the 500 to 1000 J/kg range. In a high-shear/low-CAPE (HSLC) environment, damaging winds and isolated tornadoes can occur (supported by experience with previous HSLC events and documented in the formal literature). Shear will continue to be impressive in the afternoon and evening hours, granted the highest helicity values will be up to the north where the warm front is located. Some of the models are wanting to introduce the potential for a QLCS (Quasi Linear Convective System), also simply known as a squall line. If we can tap some instability into Alabama and Georgia, then the line could develop and intensify as it pushes off to the east. 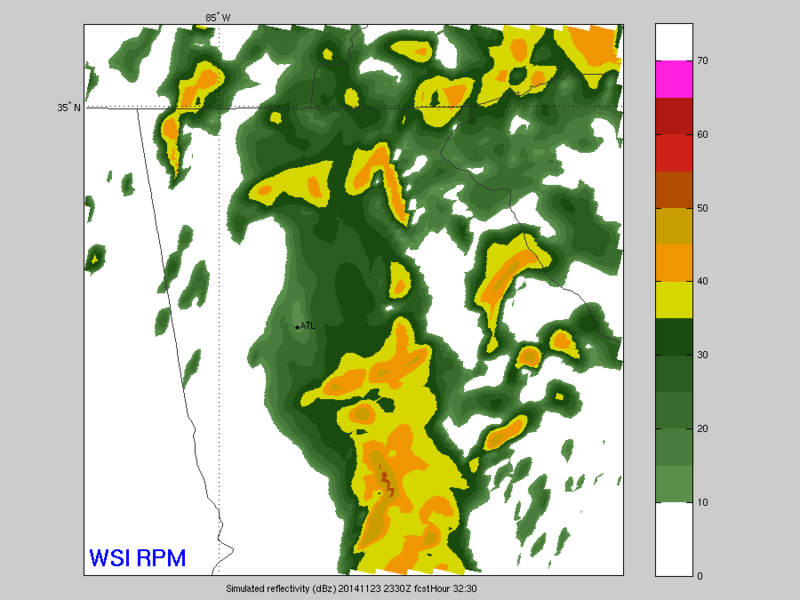 Widespread 1 to 2 inches of rain is expected on Sunday, with locally higher amounts south of I-20. We will update as necessary. North Georgia: Heavy rain will be the biggest threat. Can’t rule out a few isolated wind gusts, but most of the severe weather will develop south of I-20. Rainfall totals of 1-2 inches likely areawide; locally heavier amounts possible, particularly south of I-20. Timing: Rain likely after 5 a.m. EST and continuing throughout the day into the evening hours. Another surge of rain could push into the area during the evening hours with stronger storms well to the south. Central Georgia: Two waves likely: In the morning and again in the late afternoon/evening hours. Rainfall totals of two to four inches likely with the heavier amounts off to the south and east. Minor flooding possible, especially if storm drains are clogged up by leaves/debris. Timing: Heavy rain likely after midnight and continuing until the noon hour. Can’t rule out the chance for some gusty winds and isolated tornado as the warm front interacts with the wedge to the north. Fortunately, the threat for severe weather is super small with zero instability. Second round will occur in the afternoon and evening hours (2-8 p.m. EST), and this has the best chance for a few storms to be strong or severe. If we CAPE levels increase in the afternoon, then severe weather could be possible. Mainly expecting a QLCS or a broken line of storms to push through during this time frame. Main threat will be damaging winds and an isolated tornado. Whenever severe weather is a threat in your area, it is always important to have a plan and have multiple sources to receive watches and warnings. A NOAA Weather Radio, Weather Apps, sirens, and even social media/websites are great sources for notifying you of warnings. However, never rely on one source, especially a siren as it is meant to be heard only when you are outside. Always have multiple sources to receive your weather information. Use our interactive radar to follow the thunderstorms tomorrow. If you want to view other data layers, just click the “layers” button in the lower right hand corner of the radar window. To view the future radar (predictive radar for the next 24 hours), just click the “future” button, then animate using the arrow. Tagged Athens, Atlanta - Significant Weather Events, Central Georgia, Cold Air Damming, Georgia, Macon, North Georgia, Severe Weather, Tornadoes, Wedge.